INDICATIONS: Multi – Betic Multi Vitamin Advanced Diabetic Formula – From the makers of Diabetic Tussin Products Good health – from head to toe! Advanced Diabetic Formula with Alpha Lipoic Acid, Lutein & Lycopene. Helps maintain a healthy blood sugar level. Provides superior antioxidant protection. Promotes healthy nerve function. Multi-betic’s new formula provides you with an exclusive combination of vitamins, minerals, and other essential supplements. It helps maintain the healthy structure and function of your heart, arteries, veins, and capillaries; your brain, spinal column, and peripheral nerves; your skin, bones, muscles, and connective tissue; your organs of sight, hearing, and taste; your kidneys, liver, pancreas, and digestive system; your DNA, cell membranes, and intercellular communication. Just 1 tablet twice a day helps you maintain good health from head to toe!. Only Multi-betic offers you this unique combination of super supplements! Alpha-lipoic acid: A biological antioxidant. Increases the efficacy of other antioxidants such as vitamins C and E. Nourishes your nervous system. Enhances energy production. Supports cardiovascular circulatory system. Lutein: An optical antioxidant, present in the macula of the retina and in the crystalline lens of the ye. Helps maintain the structural integrity of the macula and the lens. Lycopene: Has the highest antioxidant activity of all the carotenoids. May inhibit the oxidation of DNA, stimulate communication between cells, and supports lung and prostate structure and function. Natural Vitamin E: Proven to be superior to the synthetic vitamin for its health-giving antioxidant activity. Provides superior antioxidant protection, Promotes healthy nerve function. Multi-betic’s new formula provides you with an exclusive combination of vitamins, minerals, and other essential supplements. Just 1 tablet twice a day helps you maintain good health from head to toe. *SUGARDOWN® is a tasty, chewable, non-systemic dietary supplement that supports healthy post-meal blood sugar levels. SUGARDOWN® works in the stomach and intestine to inhibit enzymes that release glucose from complex carbohydrates from foods like bread, pasta, rice, potatoes, or fast food snacks and drinks. SUGARDOWN® shows in a clinical study, to reduce both post-meal blood sugar and insulin. Try a chewable SUGARDOWN tablet right before you eat and experience the difference. SUGARDOWN is a patented chemistry using a proprietary modified mannan derived from natural plant source. SUGARDOWN is made in the U.S.A. and manufactured under strict “Good Manufacturing Practices” guidelines in an FDA-inspected facility. Destiny perfume by Marilyn Miglin, 0.5 oz 4 Pc. Gift Set ( Bath & Body Oil + 4 Scented Bath Tablets + Bath Crystals 22 Oz + Silver Gift Baskets ). Insinase is a nutritional supplement with scientifically tested ingredients designed to support insulin function. Developed through the ExpresSyn Process, Insinase provides selective kinase response modulators (SKRMs) in the forms of RIAA and acacia. Kinases play an important role in healthy insulin signaling and overall insulin function. superior quality supplement delivers 2 mg of vanadium, an important trace minerals. Does not contain yeast, corn, wheat, sugar, salt, soy, starch, dairy, fish or animal derivatives,preservatives, artificial colors or flavors added. Does Not Contain: Yeast, Corn, Wheat, Sugar, Salt, Soy, Starch, Dairy, Fish, Animal Derivatives, Preservatives, Artificial Colors or Flavors Added. 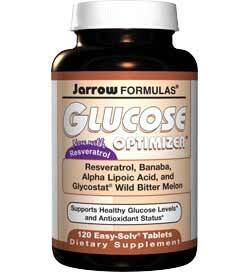 Dietary Supplement Supports Glucose Utilization Chromium plays an important role in glucose utilization and is required for the release of energy from glucose. * Vegetarian Caplets No Sugar, No Starch, No Artificial Colors, No Artificial Flavors, No Preservatives, Sodium Free, No Wheat, No Gluten, No Corn, No Soy, No Dairy, and Yeast Free. All mineral weights shown are elemental. *These statements have not been evaluated by the Food and Drug Administration. This product is not intended to diagnose, treat, cure, or prevent any disease. Perfect for pocket, purse, glove compartment, etc. 1 tube, 10 tablets. Perfect for pocket, purse, glove compartment, etc. 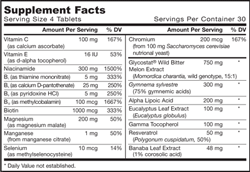 Twice daily multivitamin and mineral formulated for diabetics. Daily Support Nutrients- Cinnamon, Neem, Chromium & Fenugreek for healthy blood balance. Plus Taurine, L-Carnitine & Vanadium which are often low in diabetics. Antioxidants- Vitamins A, C & E, plus Selenium, Alpha Lipoic Acid, Lutein & other flavonoids to maintain cell and tissue strength. MEGA Potency B-vitamins- to protect nerves and maintain nerve sheath. Good health – from head to toe! Advanced Diabetic Formula with Alpha Lipoic Acid, Lutein & Lycopene. Helps maintain a healthy blood sugar level. Provides superior antioxidant protection. Promotes healthy nerve function. (These statements have not been evaluated by the Food and Drug Administration. This product is not intended to diagnose, treat, cure or prevent any disease.) Free of: Sugar, starch, wheat, corn, milk products, yeast, artificial colors-flavors-sweeteners. Multi-Betic’s formula provides you with an exclusive combination of vitamins, minerals, and other essential supplements. It helps maintain the healthy structure and function of your heart, arteries, veins, and capillaries; your brain, spinal column, and peripheral nerves; your skin, bones, muscles, and connective tissue; your organs of sight, hearing, and taste; your kidneys, liver, pancreas, and digestive system; your DNA, cell membranes, and intercellular communication. Only Multi-Betic offers you this unique combination of super supplements! Alpha-Lipoic Acid: A biological antioxidant. Increases the efficacy of other antioxidants such as Vitamins C and E. Nourishes your nervous system. Enhances energy production. Supports cardiovascular circulatory system. Lutein: An optical antioxidant, present in the macula of the retina and in the crystalline lens of the eye. Helps maintain the structural integrity of the macula and the lens. Lycopene: Has the highest antioxidant activity of all the carotenoids. May inhibit the oxidation of DNA, stimulate communication between cells, and support lung and prostate structure and function. Natural Vitamin E: Proven to be superior to the synthetic vitamin for its health-giving antioxidant activity. Just 2 tablets twice a day help you maintain good health from head to toe! (These statements have not been evaluated by the Food and Drug Administration. This product is not intended to diagnose, treat, cure or prevent any disease). 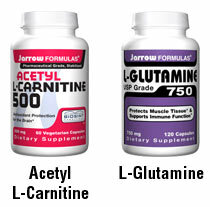 Made in the U.S.A.
Twice daily multivitamin with Alpha Lipoic Acid, Fenugreek and GTF Chromium for daily support. Does Not Contain: Preservatives or food allergens, yeast, milk, lactose, wheat, corn or iron. Miracle berry tablets turn sour foods sweet. How does it work? Place a Miracle Frooties serving (one tablet) on your tongue, let it dissolve, and after it has melted you can bite into a lemon and it tastes like lemonade! Must be experienced to be believed. Miracle Frooties can be enjoyed with friends and family. Make your own “flavor tripping” parties. Miracle Frooties XL contain 600 mg of the active ingredient in Miracle Berries, a fruit native to West Africa. What are Miracle Berries? They are small berries which contain the glycoprotein called Miraculin which modifies taste perception. Once Miraculin binds to the taste buds it creates a fascinating sensation. Suddenly a glass of ale tastes like chocolate and a sour lemons and limes turn sweet, thanks to the temporary altered state of the taste receptors on your tongue. Sugar free desserts and cocktails are other popular applications. The sensation typically lasts 15-30 minutes. People looking to limit their sugar intake and enhance their diet may enjoy the benefits of this product. Each package has ten tablets. You will receive five packages (or 50 tablets) at a special discount price. Here are some suggestions of foods to eat with Miracle Frooties: Lemons and Limes, Oranges, Tomatoes, Cranberries, Grapefruit, Kiwi, Pineapple, Granny Smith Apples, Strawberries, Pomegranate, Raspberries, and Grapes. Perfect for “flavor tripping” parties. An All-Natural Diet Aid That Helps You Lose Weight. Pharmacist Weight Loss FormulaTM has been formulated manufactured and tested by Pharmacists for optimum results and effectiveness. Pharmacist Weight Loss FormulaTM contains Citrimax, a patented and all-natural substance used to promote satiety at lower doses and fat burning and weight loss at higher doses Pharmacist Weight Loss FormulaTM has been tested for bioavailability to ensure total absorption into your system. Many diet pills on the market are loaded with various stimulants, such as caffeine, ephedrine and phentermine, which can be harmful to healthy people and possibly deadly to people with heart conditions. Pharmacist Weight Loss FormulaTM contains NO STIMULANTS! That’s right, NO STIMULANTS! 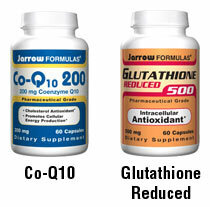 You can take Pharmacist Weight Loss FormulaTM and not have the jitters or shakes associated with many diet pills. Are you tired of having your heart race when you try a diet pill? Pharmacist Weight Loss FormulaTM does not have “speedy” ingredients. Vitamin C plays a necessary role for your general health. It is water soluble so the body cannot store it. 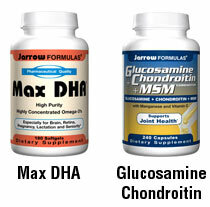 You need it on a daily basis through either through diet or supplementation. It helps in the repair and growth of various tissues throughout the body. It helps to heal wounds and maintain and repair cartilage, as well as teeth and bones. During every healing process, the body uses massive amounts of Vitamin C. It blocks damage from free radicals and can protect against high cholesterol, the common cold, obesity and weight loss, osteoarthritis, heart disease, age-related macular degeneration, Alzheimer’s disease and diabetes. Traditional Chinese medicine to help better blood circulation, to prevent stroke. It also can help chronic liver by carrying more blood flow into the area. It may protect kidney tissues from damage caused by diabetes. It helps to improve blood circulation by reducing blood clotting causing fibrin descrease of the thinkness of the blood. It includes the key anti-oxidant nutrients, Vitamin A, Vitamin C, Vitamin E, and Selenium, as well as, Alpha Lipoic Acid which, along with its anti-oxidant benefits, may help maintain healthy glucose metabolism. Folic Acid is added as support for normal heart health and Chromium Picolinate to aid in the normal metabolism of protein and fat. 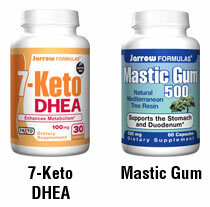 With added herbal support from Bitter Melon and Gymnema Sylvestris, 21st Century’s Diabetic Support Formula is specifically designed as nutritional support for people with diabetes. Folic Acid is added as support for normal heart health and Chromium Picolinate to aid in the normal metabolism of protein and fat. Diabetic Support Formula is specifically designed as nutritional support for people with diabetes.